When it's time to re-sheet your polytunnel, we're the one-stop-shop for all the bits you'll need. 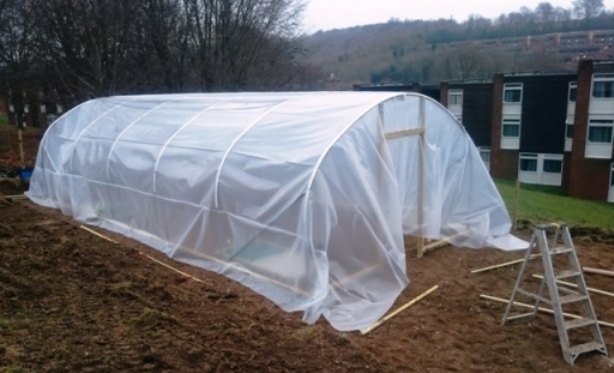 Using our guides, you can accurately calculate what size of cover to order by taking a few simple measurements of your polytunnel. Distance over arch (A) = 5.7m and polythene is trenched along the sides. 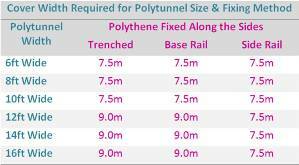 Width of polythene required = 5.7m (A) + 1.6m (trenched) = 7.3m. Use the next width up which is 7.5m wide. Distance from door post to soor post around the side (B) = 6.1m. Or you can use the tables below to check your polythene cover size. You'll also need a few battens to secure your polythene cover to the end frames and base rails if you have those fitted. And don't forget to add a few extra if you want to re-clad your doors. We supply battens at 38mm x 19mm and 1.8m long, which are tanalith treated to increase their durability. 50mm long galvanized nails will go nicely through the battens and into the timber rails. Allow about a dozen nails per batten. If your anti hot spot tape is coming adrift it would be prudent to replace it to ensure you get the most out of your polythene cover and avoid the polythene degrading prematurely. You can choose which type and size of polythene you want and any other bits and bobs from the list below, all in one easy step.